India is one of the three countries responsible for crystalizing the idea of global initiative to accelerate the pace of innovation and make clean energy widely affordable, which culminated in Mission Innovation. Being a founding member and as steering committee member, India has played an active role in all Mission Innovation activities. India recognizes the importance of addressing the energy-related challenges facing the country and globe in an environmentally benign cost effective manner. Energy security, reduced pollution, access to electricity for our people who currently lack it and reduced emissions are some of issues which Indian government considers necessary for reducing the adverse impacts of climate change. For this Government of India considers international cooperation essential and thus was instrumental in shaping Mission Innovation. Hon’ble Minister for Science & Technology, Earth Science and Ministry of Environment, Forest & Climate Change Dr. Harsh Vardhan headed the Indian delegation and attended the first and second Mission Innovation Ministerial along with Senior Officials from the Ministry of Science & Technology, Ministry of New and Renewable Energy and Ministry of Power. India along with other member countries has agreed to double its investments in span of 5 years on development of clean energy technologies over the base investments of 2015. The Mission Innovation programme is being coordinated by Department of Biotechnology, as a key nodal agency and facilitating national efforts in collaboration with concerned ministries to promote RD&D efforts to accelerate clean energy innovations. India is an active Member of Mission Innovation and Co-lead of three Innovation Challenges: Smart Grid, Off Grid Access and Sustainable Biofuels. As one of the world’s fastest growing major economy, India’s energy needs are immense. According to an energy forecast, India will be the key driver of global energy demand in the next twenty-five years. India’s energy consumption will grow by 4.2 % a year for the next twenty-five years. India has planned to draw 175 Giga-Watts of energy from renewable sources by 2022.This includes 100 Giga-Watts from Solar Energy and another 75 Giga-Watts from Wind, biomass and other sources. India is the fifth largest producer of solar energy in the world and also the sixth largest producer of renewable energy. The Government has also embarked on a major mission for construction of 100 smart cities that will use both renewables and energy efficient technologies. India, hosts the International Solar Alliance (ISA) which can have member countries lying between Tropic of Cancer and Tropic of Capricorn. More than one hundred and twenty one member countries have already joined ISA. This coalition looks to provide a collaboration platform for member countries to address their energy needs, especially through utilization of solar energy, to promote sustainable energy models. The Indian government is investing an initial $30m in setting up the alliance’s headquarters in India. Strengthening capacity building for specific skill requirements. International scientific and technical cooperation in the area of clean energy is established in accordance with national priorities and socio-economic development strategies and goals. Modalities of such cooperation include joint research and technology development, field studies, pilot-scale plants, and demonstration projects with active involvement of research institutions and industry on either side. Appropriate bilateral and multilateral cooperation programs for sharing of technologies and funding are developed. Participation in international partnerships and exchange of scientists, wherever necessary, is also explored. To meet the ambitious national target for a green path to growth, R&D and demonstration projects are supported through grants and in some case for setting up specialized centres in high technology areas. These special centres develop linkages between the organizations/agencies undertaking technology development and the user organizations and transfer of know-how is thus facilitated to industry. With a view to achieve global competitiveness, participation by industry in R&D and technology development is encouraged with increased investment by industry. India has addressed the seven Innovation Challenges covering RD&D, early stage research needs assessments to technology demonstration projects by organizing country workshops for all seven challenge with participation from subject experts, industry representatives and policy makers. The National workshops gave a fair idea on current status of R&D, R&D gaps, technology readiness levels and areas of collaborations. In addition to Thematic workshops on innovation challenges, a country Stakeholder’s meet on Public-Private Cooperation for Clean Energy Innovation was organized to encourage increased engagement from the research community, industry, and investors, while also providing opportunities for new collaborations. A clear need was felt to bring up to pilot scale, some of the technologies which are proven in lab scale so that private sector industry can invest in further commercialization. India is a co-lead for the MI challenges on Smart Grids, Off-Grid Access to Electricity and Sustainable Biofuels. India has organized International Mission Innovation Conference on Smart Grids and Sustainable Biofuels to define research priorities and develop action plan with member countries. There was enthusiastic participation from the international MI community. In the area of Smart Grids a country report was released in 2017 and the “The New Delhi Declaration” was signed on intent to collaborate. The International conference on Sustainable Biofuels was organized with active participation of Biofuture platform in 2018. The New Delhi declaration was released for Sustainable biofuels, highlighting intent of MI countries to work in collaboration mode in development and deployment of sustainable biofuels on commercial scale by sharing best practices. A call for inviting proposals in IC-4 Sustainable Biofuels for joint R&D with MI member countries is expected during the third MI ministerial. A significant development from the MI workshops was the funding opportunity announcement for US$ 5 millions each on Smart Grids and Off Grid Access to Electricity by the Department of Science and Technology. 9 projects each have been identified for award for both these challenges. Other cross-cutting technologies in Carbon Capture, Utilisation and Storage or research (energy system analysis, basic energy research that cannot be allocated to a specific category). Following the launch of Mission Innovation, the Department of Science and Technology (DST) announced a new Initiative to Promote Habitat Energy Efficiency (I-PHEE). I-PHEE is focused on promoting R&D activities to improve energy performance of buildings and cities and support enhancement of knowledge and practice to save energy in design, construction, and operation of human habitats. The program will support specific outcome-based research in the areas of energy efficient building envelope technologies, low energy cooling systems, day-lighting and electric lighting, building automation and controls for energy savings and research. Building envelop: Building materials and /or construction technology for walls, roofs, windows which will help reduce operational energy, increase thermal comfort, or reduce embodied energy of building. Low energy cooling: Novel systems that help achieve thermal comfort, direct /indirect evaporative cooling, ground couple cooling, geothermal, passive down draft systems. Buildings and cities automation and controls: Cost effective sensors, controllers, automation system hardware, and / or software to help save operational energy of buildings and cities. Development of test protocols, methods, data acquisition tools and methods for building energy benchmarking or development of any scientific procedure to help derive policy, codes and standards. India has most ambitious programme of transport fuel quality upgradation for reducing the emissions both by using better fuels and modern technology vehicles. India now supplies BS-IV (Euro-IV) fuel quality, which saw an investment of Rs 60,000 crores (approx US$ 9.1 b) . In a major policy shift, Govt has decided to jump to BS VI (Euro VI) fuel quality by 2020 which will see additional investment of Rs 28,000 crores (US$ 4.4 b) in refineries upgradation. Alongside the vehicles are also been upgraded with most vehicles having catalytic convertors and meeting at-least BS IV emission norms. The government has introduced bioethanol and biodiesel in transport fuels and also use of CNG in diesel vehicles for reducing emissions. The government also mounted a National Mission on Electric Mobility which envisages R&D programme on setting up Technology Platform on Electric Mobility (TPEM). DST initiated steps to keep a close watch on the innovations in the field of “Electric Mobility” in support of the manufacture of vehicles under the “Faster Adoption and Manufacturing of (hybrid) Electric Vehicles (FAME)” scheme of the Department of Heavy Industry (DHI). The National Policy on Biofuels mandates a blending of biofuels of approximately 20% of biofuels in transport fuels. This is an ambitious target and several steps have been undertaken to broad-base the feedstock for biofuel production and R&D for new technology and feedstock is being supported to achieve this. The Ministry of Science and Technology and the Ministry of New and Renewable Energy have placed a special focus on algal biofuel as an area of interest in Mission Innovation. Department of Biotechnology (DBT) has established four Bioenergy Research Centres in the country that integrate basic and translational science capabilities for biofuel development and scale up. The major focus has been on cellulosic ethanol and algal biofuel. Early results of these centres are encouraging and demo scale technologies for cellulosic ethanol have been established in country. Based upon this success, Government of India has decided to set up several large commercial scale cellulosic ethanol plants using waste agricultural resides as the feedstock. Six of these, about 400 ton feed per day, plants are approved by major oil marketing companies based upon indigenous technology and are likely to be operational by 2019. Other biofuel technologies such as bio-diesel, bio-hydrogen and bio-methane. The research at the Centre covers: Synthetic biology, Fermentation technologies, Separation technologies, Enzyme technology and Algal biotechnology. This centre has developed an economically viable and scalable technology for cellulosic ethanol from all types of agricultural residues and energy crops. This technology has been successfully scaled up at 10 TPD level and is now building two large scale commercial plants of 400TPD capacity. A state-of-the-art laboratory for algal biotechnology has been set up at the Centre with basic infrastructure with a sunlit environmental chamber, 1,000 ltrs and 5,000 ltrs. Raceway Ponds with novel designs as well as controlled photobioreactors, all equipped with microprocessor-based SCADA controlled systems have been established. The centre has active collaborations with Joint BioEnergy Institute, USA and University of Nottingham, UK. More information on DBT-ICT can be found at www.dbt-ceb.org. The centre has been successful in developing key technologies for ‘potent enzyme composition for biomass hydrolysis’, ‘engineered bacteria for C5 fermentation to ethanol’ and ‘engineered algae with enhanced CO2 sequestration’. System biology approach, to build a metabolic pathway model and to identify genes for key cellulolytic enzymes are underway. Cyanobacterial strains from Indian culture collection have been characterised for alkane/alkene production. More information on DBT-ICGEB can be found at www.icgeb-bioenergy.org. 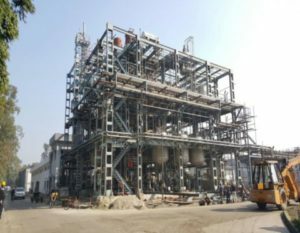 The centre has done commendable work in development of new and economical pre-treatment process, feedstock selection/development and characterization, process optimisation for saccharification/ Fermentation and scale up, Bio-assisted / Chemical lignin de-polymerization and Lignin value addition, and commercial scale enzyme development. Based upon centre’s R&D efforts a 10 TPD cellulosic ethanol plant is under construction. A large pilot plant for waste gas fermentation has been established and developed enzymes have been successfully scaled up to 5000 lit fermentor. More information on DBT IOC can be found at www.dbtiocberc.org. PAN IIT Bio-energy Centre constitutes a network of 32 investigators from 5 IITs working on 5 thematic areas. This is the largest virtual bioenergy center recently established by DBT comprising 22 sub-projects under seven groups. More information can be found at www.dbtindia.nic.in. Ten post-doctoral fellows attracted back to country under the Energy Bioscience Overseas Fellowships: They are now placed in some of the centres of excellences on bio-energy in the country. Launching the Bioenergy Awards for Cutting Edge Research :India and United States have joined hands to support a fellowship that will allow a group of fellows and interns to pursue cutting edge research in various areas of bio-energy in US institutes of repute. This will help build capacity in clean and environmentally safe energy. DBT established network of more than 100 scientists working to realize the goals of National Biofuel Policy with high quality research publication and patents for generated knowledge and developed technologies. The Bioenergy program also includes establishing a major network of programs on algal biofuels. There are three repositories with more than 2,000 cultures that are available for the algal biofuel program. This has been identified as an area for both bilateral and multilateral cooperation (Bioenergy Roadmap Vision 2020). Various projects under clean energy are provided to industries through Biotechnology Industry Research Assistance Councilan interface agency of DBT to strengthen and empower the emerging Biotech enterprise. The Ministry of New and Renewable Energy is working on a solar wind hybrid policy, in which wind and solar can be co-located to maximize the utilization of transmission systems, reducing cost and increasing efficiency. They are also working to develop solar floaters indigenously. More information about the wind power program can be found and more information about the solar mission can be found. The Ministry of New and Renewable Energy Hydrogen Energy Program is embarking upon the National Hydrogen Energy Road Map. This program supports research, development, and demonstration projects on various aspects of hydrogen energy including its production, storage and use as a fuel for generation for mechanical, thermal and electrical energy. More information about the Hydrogen Energy Program can be found. The Department of Science and Technology is also embarking upon a national mission to utilize methanol and di-methyl ether as cleaner fuels in automobiles and fuel for fuel-cell based vehicles. Indianoil R&D centre has established a Hydrogen dispensing station and vehicles on Hydrogen are tested for endurance. This centre has also patented a technology to produce mixture of Hydrogen and methane by partial catalytic reforming of natural gas for fueling vehicles to reduce emissions. A consortium has been formed among NTPC, BHEL and IGCAR –Kalpakkam for the indigenous development of Advanced Ultra Super Critical technology for high efficiency thermal power plants in India. Out of these three components, India has not much experience or large projects on carbon dioxide storage. However, Indian companies in power and oil sectors would like to collaborate in this area. Carbon capture technologies either by growing algae or by capture in solvents / adsorbents have been studied by several institutes. The Department of Science and Technologyis setting up a clean energy centre for integration of intermittent renewables with suitable energy storage in on grid or off grid situations. Off grid electricity systems utilising polygeneration and also solar, wind, micro-hydel, biogas, and various other forms individually or hybridised for heating/cooling/thermal applications. Augment the existing fossil with renewable sources including roof top solar as an off grid solution. Frequency and voltage stability of off grid system and developing robust control algorithm. Development and demonstration of affordable and sustainable solution/devices for wide application spectrum. Village Distributed Energy resource (DER) Grid. Hybrid distribution system (AC and DC grid). Development of efficient DC appliances and smart centralized distribution control to ensure disciplined and efficient end use of energy. The Ministry of Power is working on flow batteries, which have larger potential for energy storage and are more efficient. A programme focused on development of materials for hydrogen storage has also been initiated by DST and MNRE. Science & Engineering Research Board (SERB) under the aegis of DST is mandated to promote basic research in all domains. Besides several individual-centric projects, SERB has funded advanced research centres in the area of improved combustion and battery technologies. Department of Biotechnology has been supporting fundamental research on innovative approaches that lead to intensification of biofuel. Emphasis has been on feedstock improvement (microalgae) and biochemical processes for conversion of biomass to biofuels and production of biofuel molecules/hydrocarbons using synthetic biology and genetic engineering, hydrogen production from autotrophic and heterotrophic microorganisms. Similar projects of basic research are also funded by CSIR. However all basic research projects funded in clean energy area are focused and linked to eventual development of corresponding technologies and projects are closely monitored and reviewed. Government of India and the United States of America agreed to expand the Indo-U.S. Joint Clean Energy Research and Development Center (JCERDC) by funding new program furthering research and development on ‘Smart Grids and Energy Storage’, critical to improving the reliability, flexibility and efficiency of the electricity delivery system. This program is being administered in India by the bilateral Indo-U.S. Science and Technology Forum (IUSSTF) & DST, and in the U.S. by the Department of Energy (DOE). The DOE in US and Ministry of Science and Technology, Government of India announced the selection of the winning Bilateral Consortia project on 22 and 23 June 2017, respectively. The Government of India, through the Department of Science and Technology (DST), and the US Department of Energy (DOE) each will provide approximately US $7.5 million (Approx. Rs. 50 Crore), which will be equally supplemented by US $7.5 million from each of the consortia from India and US, bringing the total to US $30 million for this joint R&D effort. A key component of the joint program is the demonstration of the technology at several lab level pilots and ten (10) field demonstration covering rural, semi-urban and urban settings involving residential, commercial and industrial consumers. The UK partners comprises of SUPERGEN hubs in the UK which will link to leading academic centres in India in the areas of solar energy, energy storage and networks. United Kingdom’s Engineering and Physical Sciences Research Council (EPSRC) to evolve a joint India & UK research programme to help reduce energy demand in UK & India’s built stock, both new major urban developments’ currently being planned and existing built stock. DST entrusted to address particular challenges include undertaking research that can have impact during a period of rapid development including major urbanization and infrastructure development to provide access to clean forms of energy. The RCUK Energy Programme committed £3.8M with same matching commitment from DST (Government of India) to support R&D projects in the area of Energy demand reduction in the built environment. Total 22 proposals have been received against Call on “Energy demand reduction in the built environment”. Out of which 4 proposals has been supported for funding. DST initiated a major development programme for production of Methanol from various sources including Indian coal and CO2 from thermal plants, steel plants etc. The programme would also include direct utilization as drop-in fuel in automobiles and fuel for fuel cell based vehicles. 10 projects have been supported in the areas of development of novel catalysts, utilization of methanol in direct methanol fuel cell, development of engines fuelled on methanol and DME etc. The JCERDC is a joint initiative of the Government of India (through DBT and the Department of Science and Technology, Ministry of Science and Technology), and the US Department of Energy. The overall aim of the JCERDC is to facilitate joint research and development on clean energy by teams of scientists, technologists and engineers from India and the United States, and related joint activities, needed to deploy clean energy technologies rapidly with the greatest impact. Baseline has been worked out on the data available for each of the priorities sector identified under Mission Innovation for fiscal year 2014-15 (base year) this includes all Government funding by different Department/Ministries for research, development demonstration activities. Research, development and demonstration in environmentally friendly, clean energy technologies including renewable energy, energy efficiency, clean fossil technologies, electric grid technologies and advanced transportation systems and fuels and other crosscutting technologies. Investments are made through various models of joint collaboration involving public private sector, national laboratories, universities and international partners.